PRESIDENTS — Sophomores Johnson(left) and Cave (right). 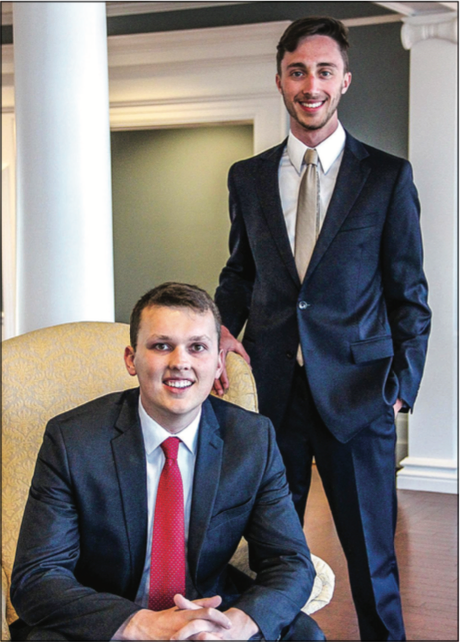 After a tight race between three campaigns, Caleb Johnson and his running mate Jared Cave won the 2017-2018 Liberty University Student Government Association election Friday, April 21. Johnson and Cave received 1,872 votes — 47 percent of the more than 4,000 votes cast. Chris Ragan and John Luke Robertson received 1,721 votes while Isabelle Shelbourne and Thomas Lisa garnered 413 votes. This year’s election resulted in a larger voting turnout than most SGA elections, SGA Chief Justice Jacob Broadway said, with approximately 3,500 people voting in the 2016-2017 elections. Johnson and Cave faced steep competition from the Ragan-Robertson ticket, which was endorsed by current Student Body President Jack Heaphy and won 43 percent of the vote. However, Cave believed he and Johnson had a strong chance of winning the election despite the endorsement. “It was intimidating, but it was also a good challenge,” Cave, a project management major, said. “I think it almost set the bar even higher. Johnson and Cave also benefited from the following they had as the current sophomore class president and vice president. “It was the sophomore base, and then there were the people that just want change in SGA — the people that are fired up because they’ve seen the same thing year after year,” Johnson, a political science major, said. Cave said he saw the student body’s desire for reform in SGA when he spoke in his economics class on election day. “I asked the whole room one question­­—’What has SGA done for you?’” Cave said. As student body president and vice president, Johnson and Cave hope to address issues like curfew, club relations and transparency between the student body and the university’s administration. But Johnson said the most important issue is increasing diversity in SGA to better represent the student body. Johnson and Cave had the opportunity to present their views on these issues at the SGA Presidential Debate Thursday, April 20. Savannah Berry, president of Young Women for America, Will Young, news editor of The Liberty Champion, and Broadway moderated the debate. The candidates discussed topics such as clubs, minority students and open dorms. Throughout the night, Johnson and Cave emphasized the importance of representing the student body to the administration. As members of SGA’s representative branch, Johnson and Cave discussed their experience working on legislation for issues like curfew policy. Johnson and Cave also hope to strengthen SGA’s relationships with the clubs it oversees by simplifying the process for clubs to book rooms and speakers. “If clubs want to book a room, they come to student government and we make the booking,” Cave said. The candidates also answered open questions from the student body at the debate. One question submitted asked how the candidates would address the student body’s perception of elitism in SGA. Johnson said while he never personally experienced elitism in SGA, he understood why some students feel alienated by the organization. “Student government is my home,” Johnson said. During the next school year, Johnson and Cave are looking forward to serving the student body and ensuring students have the tools to succeed now and as future graduates of Liberty. “We’re not going to meet everyone, and we’re not going to hear everyone’s story, but the changes that we’re going to make are going to impact them,” Cave said. “I can’t wait to give them more encouragement and more tools to be successful so that when they get out in the real world, they’re not going to just tell people about Christ, people are going to see it in them.